Deric's MindBlog: Why we hiccup. An article by Neil Shubin in the January Scientific American notes how a number of evolutionary hand-me-downs inherited from fish and tadpoles have left us with hernias, hiccups and other maladies. I thought this bit on why we hiccup was fascinating: it is because we once were tadpoles. 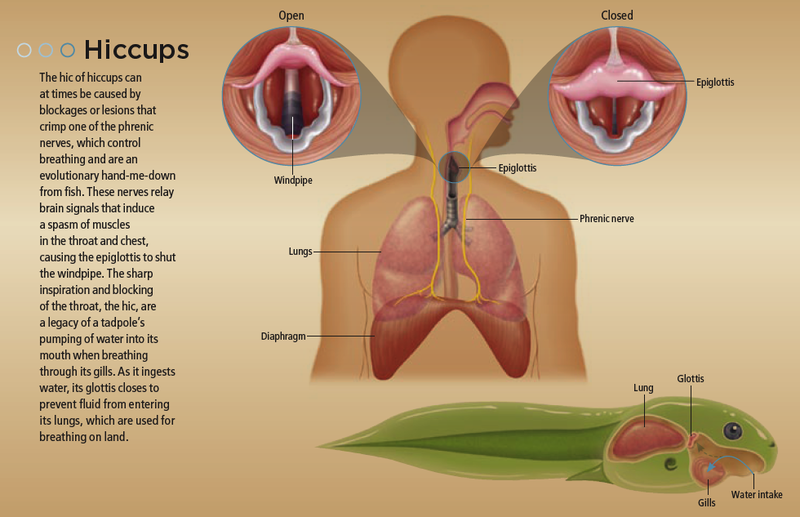 A spasm of the muscles in the throat and chest causes a hiccup. The characteristic “hic” sound results when we sharply inspire air while the epiglottis, a flap of soft tissue at the back of the throat, closes. All these movements are completely involuntary; we “hic” without any thought on our part. Hiccups occur for many reasons: we eat too fast or too much; even more severe conditions, such as tumors in the chest area, can bring them on. Hiccups reveal at least two layers of our history: one shared with fish, another with amphibians, according to one well-supported hypothesis. We inherited the major nerves we use in breathing from fish. One set of nerves, the phrenic, extends from the base of the skull and travels through the chest cavity and the diaphragm, among other places. This tortuous course creates problems; anything that interrupts the path of these nerves along their length can interfere with our ability to breathe. Irritation of these nerves can even be a cause of hiccups. A more rational design of the human body would have the nerves traveling not from the neck but from a spot nearer to the diaphragm. Unluckily, we became heir to this design from fishy ancestors with gills closer to the neck, not a diaphragm well below it. If the strange pathway of the nerves is a product of our fish origin, the hiccup itself may have arisen from the past we share with amphibians. It turns out that the characteristic pattern of muscle and nerve activity of hiccups occurs naturally in other creatures. And not just any creatures. More specifically, they turn up in tadpoles that use both lungs and gills to breathe. When tadpoles use their gills, they have a problem— they need to pump water into their mouth and throat and then across the gills, but they need to keep this water from entering their lungs. So what do they do? They shut the glottis to close off the breathing tube, while sharply inspiring. In essence, they breathe with their gills using an extended form of hiccup. (click on figure to enlarge it). In this article, the author makes a comment about how the phrenic nerves originating at the base of the skull is a poor design. That statement is actually false. The design of the nerve placement is a genius design. Let's say that the phrenic nerves originate lower like the author suggests, perhaps in the thoracolumbar region. If someone were to get injured in that region, where spinal cord injuries most often occur, they would either have trouble breathing or lose the ability to breathe on their own. Take paraplegics or quadriplegics for example; they have all lost use and feeling in their limbs due to spinal cord injuries in the thoracolumbar region but they can all still breathe! If the phrenic nerves were in the same region, they could not. Life is sustained in these people due to this perfect design... I'd even say intelligent design. Neural correlates of third party punishment. MindBlog's first PodCast: "The I-Illusion"
Eating dirt is good for you. A new kind of mind. Getting the dead to talk back. MRI of human social values? MRI in the courtroom as witness on pain? Ramachandran on qualia and the self. Get religious to improve self control?